Vivo’s smartphone with a pop-up selfie camera attracted a lot of attention. But it was its budget handsets that saw it snag the top spot in China’s smartphone market in the third quarter of this year. Counterpoint Research says Vivo sold 21.6 million handsets in that period, up 2% from the previous year. The research firm credited a lineup of handsets that pack flagship-quality features into budget devices. A report by Jiguang Data says Vivo’s most popular model was the X21, which packs a fingerprint sensor under the screen -- something even Samsung doesn’t have. Right behind Vivo was sister brand Oppo, which sold only marginally fewer handsets -- but that 21.4 million is down 11% from the year before. The same strategy -- high-end features in cheap handsets -- helped Huawei and Honor (a sub-brand of Huawei) grow rapidly, Counterpoint says. 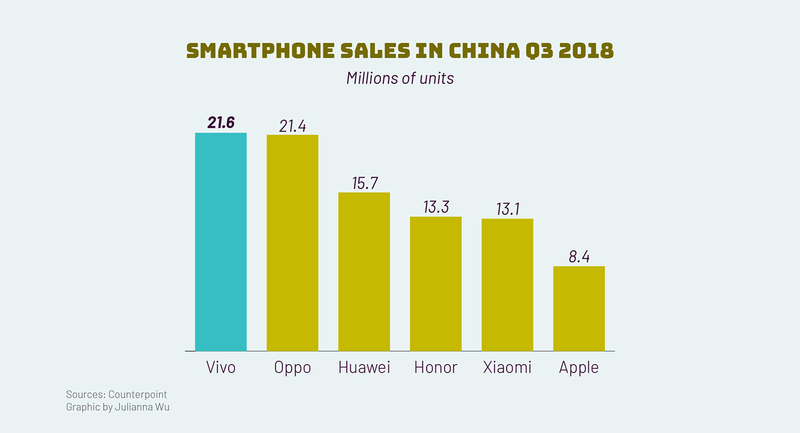 Both of them had a 14% year-on-year growth in Q3, claiming the third and fourth spot and squeezing Xiaomi to the fifth spot, who ranked the third in Q3 last year. Counterpoint says Xiaomi’s decline in this quarter is largely due to the poor sales performance of its latest flagship Mi 8. But despite the sharp decline, Xiaomi’s actually doing pretty well right now: Its smartphone revenue has actually been growing, based on its latest earnings report. That’s because of its bigger presence in markets outside of China such as Western Europe and India. It surpassed Samsung to be the biggest smartphone vendor in India, and has just “simultaneously” added another 500 stores in the country. As for Apple, well, it only ranked sixth and took 7.7% of the market share in China last quarter, which Counterpoint says is down to weak demand for the pricey iPhone XS and iPhone XS Max. This period doesn’t include the iPhone XR, which is priced lower, but reports so far suggest demand for that may not change the rankings too much. But the biggest standout figure here aren’t how the big brands are doing -- it’s how everyone else is doing. Because beyond the big six in this chart, sales for all the other smartphone makers are down a staggering 48% from the same period a year ago. It shows how China’s cutthroat smartphone market is squeezing companies out of the picture. Just this week Meitu announced that Xiaomi will take over making its handsets. Judging by the numbers, they won’t be the only ones giving up on the smartphone race.